A reader recently pointed out that the DOTS 1969 Cadillac Coupe DeVille convertible is actually a '70. How did he know that? Because he owns the most famous 1969 Cadillac DeVille convertible in the world! Back in 1969, a routine-harassment-of-gays police raid on the Stonewall Inn in New York City touched off the not-so-routine Stonewall Riots. Henderson was there, and his brand-new DeVille was parked in front of the bar. It was spared any damage in the chaos that followed, the police impounded it, and since then the legend of the Stonewall Cadillac has continued to grow. 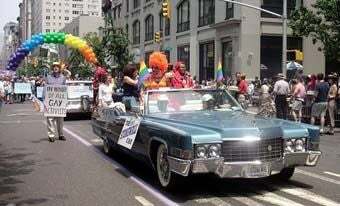 These days it's pretty much a parade car, getting plenty of duty in the annual NYC Gay Pride parade and other events. Check out the Stonewall Rebellion Veterans' Association site for the whole story.